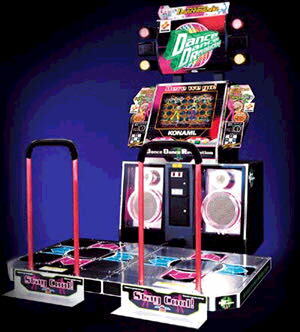 DDR is a very simple game. 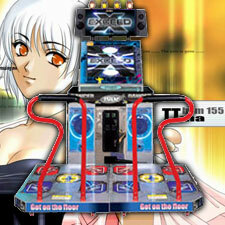 There is a stage with four arrows: up, down, left, and right (though in some versions, there are 6 arrows including up-left and up-right), on which the player steps in accordance with the matching arrow step pattern on the screen. 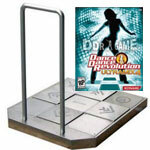 The player stands on a metal stage in front of the main screen/unit. There are four arrows on each player's side (the four cardinal directions) on which the player can step. On the screen, arrows matching the direction of the arrows on the stage will scroll on the screen. When the moving arrows line up with the stationary arrow "casting" at the top of the screen, the player (should) step on the corresponding arrow. The arrows scroll up (or down) the screen amidst psychadelic backgrounds/dancing characters (and in the newer mixes, animated movies). After selecting your music, it's time to play. When the scrolling arrows overlap the stationary arrows, you then step on the corresponding arrow on the platform. At the end of the song, you are given a breakdown of your performance (the accuracy of your steps, which is graded (worst to best) "MISS", "BOO", "GOOD", "GREAT! ", or "PERFECT!! "), and your final letter grade , which, ranges from "E" (fail) up to "A", "AA" (high percentage of accurate steps), or even "AAA" (All Perfects).